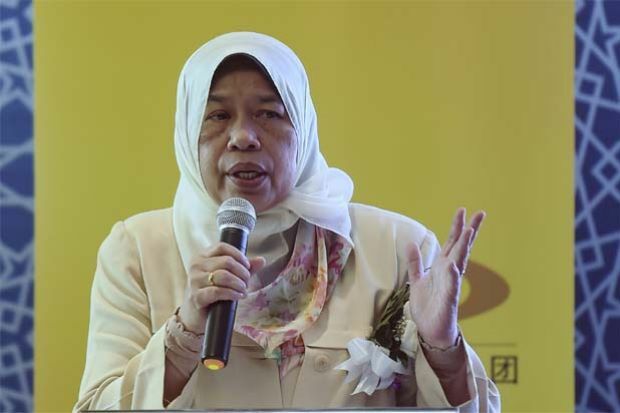 PETALING JAYA, Malaysia - Housing and Local Government minister Zuraida Kamaruddin wants to set up a support system in low-cost flats where parents at home will be given incentives to help look after their neighbours' children while they are out. She said this when she visited the Kota Damansara low-cost People's Housing Project (PPR) flats this morning, where three-year-old Siti Nur Nadhirah Hairul Anuar fell to her death from a 17th floor balcony around 7am on Thursday (Sept 13). This was the fourth incident to happen at the Kota Damansara PPR, where a young child had fallen over a balcony railing. Three of the four incidents were fatal. According to news reports, the girl's older sister, 14, had sent their 7-year-old brother to kindergarten in the morning, leaving the toddler who was having a fever to sleep at home. Their parents were out selling nasi lemak at the time. Siti was still sleeping when her siblings left the home but presumaby awakened and panicked to find the flat empty. A stool was found near the unit's kitchen balcony railing where she was suspected to have fallen from. Siti's sister returned only to find the girl's lifeless body at the foot of the block. Zuraida said that the idea aimed to solve the problem of child care in low-cost housing areas while parents are out working or running errands. "Taking care of children in the low-cost community has become an issue because the family cannot afford to hire maids or send their children to daycare," said Zuraida. "Instead, they have to depend on an older sibling while both parents have to be outside making a living, and the children are left somewhat neglected." While past incidents were blamed on rusty balcony railings, Zuraida said that the condition of the building was not the cause in this particular incident. She added that she was also not in favour of putting up so much grilling that it would make the home seem like a jail. "We need to get to the root of the problem, which is the inability of B40 families to handle family and household matters due to the difficulties they face in making an honest living." Zuraida said that her idea for this community babysitting system was part of a new national community policy which she plans to finalise by the end of September. She added that a pilot study had been conducted at PPR Sentul and another PPR complex in Kelantan, and they were hoping to get the programme started by Oct 1. "In light of this tragedy, I hope this programme will receive the support and active participation of the local community. "My condolences goes out to the family for this unforeseen tragedy," she said, adding that the ministry will provide counselling and support to the family in this time of grief.